2014 Fiat 500L Pros and Cons: Why (Not) This Car? There are stylish cars and there are functional cars. But there aren't many stylish functional cars. There have been a few, though. Chrysler gave us the PT Cruiser a few years back. People paid well over sticker at first. Later Chrysler practically had to give them away. Scion got off to a strong start with the xB. Nissan tried to replicate the xB's success with its JDM rival, the cube. Neither the cube nor a larger second-generation xB has sold well. But Kia has succeeded where Scion failed, improving on the xB with its Soul. Into this high-risk segment FIAT is launching its second model. Will the 500L succeed like the Soul (review), or founder like the cube? Note: the Kia Soul compared in this review was the first-generation car. The second-generation Soul is much better. Italian flavor. More exciting colors available. For more attractive fabric, get the Trekking. Why the 2014 Fiat 500L? FIAT returned to North America after a lengthy absence with the 2011 500, a retro revival of the car that was to the company and Italy what the original Beetle was to VW and Germary. After a slow start, the 500 has been selling about as well as another reborn icon, the two-door MINI. But the North American potential is limited for such a small car, even a cute one. To broaden the brand's reach on this side of the Atlantic, FIAT has grafted the 500's signature mustachioed face onto a much larger, four-door vehicle. Though the resulting combination isn't pretty, the 500L offers a dose of cute and friendly in a segment that hasn't had much of it since the PT Cruiser went away. Okay, it has the cube and Countryman, but Nissan's playroom on wheels is smaller, weaker, and apparently just too weird for Americans while the MINI is expensive. The 500L doesn't appear weird, just cursed with ungainly, top-heavy proportions somewhat like those of the late Honda Element. The Kia Soul's more wheel-centric body is better-proportioned, but also much edgier. While I personally find it more attractive than the FIAT, people seeking something cheerful will gravitate towards the 500L. Since personal tastes play such a large role, I haven't rated the cars in this area. 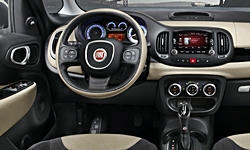 The FIAT's interior similarly incorporates some stylish touches, most notably a squircular steering wheel. None of the materials seemed luxurious in the tested mid-level Easy trim, and a few seemed iffy, but the vinyl-wrapped instrument panel face is a nice touch. For a more rugged and attractive seat fabric, step up to the SUV-look Trekking variant. Or, if you'd prefer leather, it's optional on the Trekking and standard on the Lounge. The front seats in the 500 (no L) aren't my favorite aspect of the car (to put it lightly). Those in the 500L are totally different. They're not luxurious. They're not sporty. But they're firm without being overly firm and the way the seatback angles forward from its midpoint provides excellent mid-back support. A power lumbar adjuster is available, but the tested car lacked this feature and I didn't miss it. The Soul's front seats are flatter, firmer, lacking in lumbar support, and generally much less comfortable. Not so cute from this angle. Squircular steering wheel. Controls easy to reach and use. The 500L's nearly 66-inch height (about eight more than the average car) precludes sports car handling. But, for what it is, the size-L FIAT handles surprisingly well, with moderate lean, good composure, and eager responses. Quick lane changes on the highway provoke just a little rear-end sway.The 500L's steering can feel a touch heavy and vague, and its tires' limits aren't high, but it's safe and easy to exploit what grip is available. The Kia Soul leans more and becomes clumsy when hustled.The more luxurious Buick Encore has good road manners, but doesn't feel as taut or as responsive as the 500L. Neither the Kia nor the Buick is as fun to drive as the FIAT. This said, if fun-to-drive is your top priority in a small crossover, the MINI Countryman is the way to go. But you'll get less space for people and cargo--and pay much more. The FIAT 500L's EPA ratings--24 mpg city, 33 mpg highway--are about as good as you'll see in a small, conventionally propelled crossover. The Buick Encore does a touch better (25/33), but the MINI doesn't (23/30), and the Kia Soul scores considerably worse, at least on the highway (23/28). In real-world driving the 500L's trip computer reported averages around 30 in the suburbs (even 37 with a very light right foot) and about 35 on a 70-mph highway. Two caveats. Make a lot of use of the turbo, and fuel economy will plummet. And while premium fuel is not required, it is recommended. The 500L can hold more cargo than other small crossovers, especially with its rear seat folded. According to the official specs (which can be gamed), the 500L can hold 68 cubic feet, vs. the Soul's 53, the Encore's 48, and the Countryman's 41. As in the Buick, but unlike the others, the front passenger seat can fold forward to extend the cargo area all the way to the instrument panel. But the fabric back of the seat doesn't make it an ideal load surface. Why Not the 2014 Fiat 500L? You sit high in the FIAT 500L, and outward visibility is good in all directions. I didn't even mind the far forward placement of the windshield, which requires an additional set of side windows ahead of the doors. The Soul's driving position avoids these two issues, but includes one of its own: the Kia's steering wheel tilts but does not telescope. The 500L's rear seat, which slides and reclines, is mounted very high off the floor, and consequently provides better thigh support than most. Slide it all the way back, and legroom is plentiful (if still not as plentiful as in the Kia). But combine the high cushion with the optional panoramic sunroof, and even though I'm only 5-9 my scalp nearly touched the headliner. Anyone who intends to carry people over 5-10 in the back seat best skip the sunroof. Without it the 500L has much more rear headroom. Happy mustachioed face transplanted from the smaller 500. Cute? Too cute? Good legroom when slid back. Comfortably high cushion. Limited headroom beneath optional sunroof. Compared to the Kia Soul, the FIAT 500L can seem over-priced. 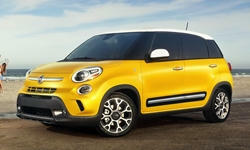 Configure both with their optional audio systems and a sunroof, and the 500L lists for $4,400 more, $24,695 vs. $20,295. In its defense, even a mid-level 500L (such as the one tested) includes many features not available on the Soul, including an AC power outlet, rear obstacle detection, a power lumbar adjuster for the driver seat, a folding front passenger seat, and a sliding and reclining rear seat. You can get automatic climated control and seat heaters in the Soul, but only in a $2,500 package that also includes nav and leather upholstery. In the 500L, dual-zone automatic climate control is included in a $700 Popular Equipment Group that is required with most other options, and seat heaters are a $350 standalone option. Adjust for the 500L's additional features, and the difference between the two falls to about $1,900. Compare the 500L to a Buick Encore or MINI Countryman, on the other hand, and the FIAT checks in much lower. A comparably equipped 2014 Encore lists for $3,410 more before adjusting for feature differences, and about $2,000 more afterwards. And a comparably equipped 2013 Countryman S lists $9,150 more before adjusting for feature differences, and about $7,200 more afterwards. You'll find more refined powertrains and nicer interior materials in either of the others, but is this enough to justify their higher prices? The FIAT 500 required few repairs early on, but has since taken a turn for the worse. The 500L is an entirely different car assembled in a different factory. But that different factory is in Serbia and once made Yugos. No one has reliability information on the 500L yet, so it's not known to be unreliable. But until the new model establishes a positive track record, its reliability is a gamble. With its FSD struts and shocks, Koni attempts to offer adaptive damping (softer rebound over bumps, firmer rebound when turning) at much less cost and complexity than with electrically-adaptive dampers. FIAT installs these Konis up front in the performance-oriented 500 Abarth--and at all four corners in even the least expensive 500L. Though I've only driven the 500L with the Konis, they seem to work as promised. Though the 500L's ride can feel a touch firm occasionally, it's well-controlled and usually smooth. An Encore rides more smoothly, but a Countyman doesn't, and the Soul's bounciness can become tiring on the highway. Given this difference and the one in front seat comfort, I'd much rather take a long highway trip in the FIAT than in the Kia. Noise levels are also fairly low in the 500L--with one exception. The 1.4-liter turbocharged engine gets noisy when revved, and the unrefined quality of this noise isn't pleasant. The $700 Beats audio system is among the best I've experienced in a roughly $25,000 vehicle, especially if you enjoy dialing up the bass. The standard audio system is also rated at 520 watts (unless FIATsler's product information is incorrect--pretty common). But the standard system lacks a subwoofer. All the hardware needed for navigation is included with the 6.5-inch touch screen-based Uconnect infotainment system (standard on all early 500Ls). But you have to pay the dealer an additional fee to activate the system's nav capability. Like other recent Chrysler / FIAT infotainment systems (which use a taller, 8.4-inch screen), this one is easier than other touch screens to operate. Unlike the 8.4-inch systems, though, this one only includes audio and nav. The climate controls and seat heaters must be activated the old-fashioned way, with real knobs and buttons. More on the FIAT 500L's turbocharged 1.4-liter four-cylinder engine, which can also be found in the 500 Abarth and Dodge Dart. This engine produces more peak power than the similarly-sized unit in the Buick Encore, 160 vs. 138, but feels considerably weaker at low rpm and doesn't transition nearly as smoothly when the turbo's boost kicks in. The FIAT's transmission, a six-speed automated dual-clutch manual, can be indecisive, and often doesn't shift smoothly. (A conventional automatic is on the way.) So while the 500L is quicker than the Encore if you plant your foot to the floor, in everyday driving the Buick powertrain behaves better. The Countryman, with a 181-horsepower turbocharged 1.6-liter, is much quicker and also somewhat better behaved. But you pay for its additional potential, and then some. The Soul's engine is larger, a 2.0-liter, but without a turbo. On paper this engine is a little more powerful, with 164 horsepower, but this power is all at high rpm and the Kia doesn't feel as energetic. The upside of the FIAT engine's less linear power delivery is that it delivers more of a thrill than the Encore's or the Soul's when prodded. Between this dual personality engine and the 500L's fairly athletic suspension, I enjoyed my week with it much more than I expected to. The FIAT 500L tops the Kia Soul in just about every area. It feels quicker, gets better fuel economy, handles and rides much better, has more comfortable front seats, and can hold more stuff. A redesigned Soul is on the way, but the changes for 2014 probably won't eliminate all of these deficits. On the other hand, the Soul's price should remain much lower. For many people, $4,000 can compensate for many shortcomings. A Buick Encore is more refined and luxurious, and a MINI Countryman feels sportier and is more fun to drive, but neither can carry as much cargo and both cost much more. The 500L's aesthetic advantages are much more debatable. Some people will be attracted by vehicle's happy face, others will be turned off by it. Anyone with an eye for proportions won't care for the larger FIAT's. Inside, the 500L has a character all its own, as might be expected from a car designed by Italians for Italians. Is this an advantage? Up to you. Then there's the big question mark, reliability. Will the 500L hold up better than the 500 has? Time will tell. TrueDelta will have reliability stats for the new model as soon as we can. Even a large, unusually thick engine cover can't silence the racket. Cargo floor raised to level of folded seat backs. It can also be set low. FIAT and Buick each provided insured cars for a week with a tank of gas. Becky Kroll at Kia of Ann Arbor (734-663-7770) provided a Soul for a test drive. MINI of Ann Arbor providing a Countryman for a test drive. 2014 Fiat 500L pros and cons, according to Michael Karesh: the best reasons for buying (or not buying) the 2014 Fiat 500L. Join TrueDelta to post your own impressions.